Here I am, sitting at my desk, waiting for the trick or treat crowds to arrive. We’re giving out glow-in-the-dark bracelets this year in hopes of keeping the kids out there visible to traffic. The day’s been cool and it’s finally getting dark outside. Two cats are pestering me simply by curling up on my desk: one under my halogen lamp and the other on my steno shelf. They want to be fed, but that doesn’t happen until the dog goes to bed. 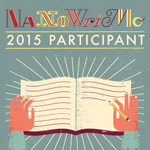 Tomorrow is November 1st, the beginning of NaNoWriMo. The Kick-Off party was this afternoon. It was a great time! Lots of new people talking with our veteran Wrimos about writing and how to win the challenge. I made pumpkin dip (a definite hit) and brought the cups/plates/plastic flatware needed. We ended up going home with more than we brought–which isn’t surprising, really. This year looks to be an especially exciting one as our library system has embraced NaNoWriMo’s Come Write In program. This is something we’ve wanted for a while. Three branches are signed up, including the main branch downtown. They’ve held information sessions and a plot party; each branch will also host one or more write-ins in November. I’m determined to nurture this new partnership for as long as I volunteer as Municipal Liaison. Speaking of that, I have a new co-volunteer, one who has worked in the library system before. My previous co-worker has moved to greener pastures on the west coast so I’m breaking in a newbie. She’ll do fine, I think; she’s already taken over the social media accounts and is keeping up with them better than I ever did. So, this year’s NaNo project. I thought about doing a prequel to the one novel I got close to finishing, the young adult story which was part X-Men, part Harry Potter, and part Girl Genius. The plot would have followed the headmistress’s family as they moved from France to the New World in the 1700s (or earlier). I had ideas at first of having them flee the French Revolution, but the whole “expelled from Acadie” history also appealed. Unfortunately, they were actually kind of far apart, year-wise. As I agonized over the amount of historical background I would have to dig into, another idea hit me. I’ve been turning a Doctor Who fanfic over and over in my head, one where the Doctor meets up with a Gallifreyan family on Earth. They’d been sent there by Time Lady Romana (companion to Doctor Four and once President of Gallifrey) to save at least some of their people if the war against the Daleks failed. Their personalities were “fobbed” (saved for later retrieval–see “Human Nature” and “The Family of Blood”) and the Doctor ends up releasing them. The key, however, was my idea for their TARDIS: it would be their garage. No matter where they went in time (I thought they’d remain on Earth, to protect it when the Doctor was off-planet) their TARDIS would be just a door in a wall somewhere. It would have Gallifreyan alphabet symbols burned on it, spelling out the family’s name. Otherwise, it would blend in with the architecture of the period. This last bit–the door–sparked my plot bunny. How about a door to anywhere? Only, instead of taking a traveler just anywhere, it took you anywhen as well. And when that jaunt into history turned out not to be exactly what you anticipated? That’s when you call in an English scholar. In any case, I still have a few hours to flesh out my characters a bit before I jump in after midnight. Hopefully you’ll see my word count rise steadily and, who knows? I might even finish a novel for a change! Posted on 31 Oct 2015 31 Oct 2015 by TikatuPosted in fan fiction, Holidays, NaNoWriMo, original fiction, WritingTagged nanowrimo, original work, word count, writing.